I have been growing Lomandra ‘Tanika’in my garden in the northern Sydney suburb of Westleigh for many years. It is an improved compact fine leaf form of the popular and widely grown Lomandra longifolia and you can classify the plant as a ‘strappy leaf’ plant. My plants are growing in a thin layer of topsoil over a clay sub soil and receive little additional watering once they were established. 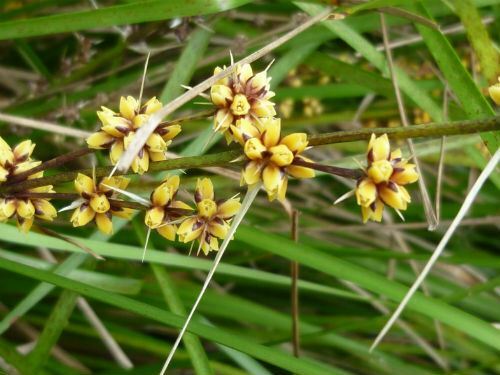 The label attached to Lomandra ‘Tanika’ advises it grows to 60cm high and 60cm wide. However many of my plants are now double that size. I suspect this larger size is due to the heavier than normal rainfall Sydney periodically receives. My original idea, when I planted Lomandra ‘Tanika’ was to mix them with a planting of native grasses (Poa species) to form a grassland meadow in my front yard, to replace a poorly performing lawn. This has worked well, although now that the plantings are mature, I realise that I should have planted them a bit further apart, to make a more open effect and mimic what happens in nature. Lomandra ‘Tanika’is a versatile plant that grows well in full sun and moderate to heavy shaded positions, will tolerate windy and salt laden positions. It is advisable to keep new plants moist for the first few months until they establish. From then on, they will need no additional watering. However, in my experience they will grow much better if given some supplementary water in prolonged hot weather. 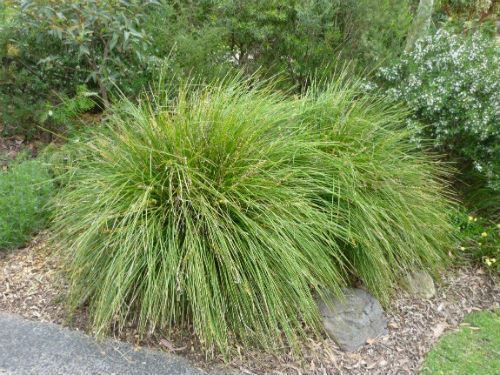 Care and Fertilising: Lomandra ‘Tanika’ do not need pruning, however if they becoming too large, they can be reduced in size by cutting back the foliage to 15cm above the ground. As with any other plant, it is best to avoid trimming or pruning in drought conditions, or in the middle of summer. I do not fertilise my plants, but they will look a lot greener if you occasionally use a slow release native plant fertiliser in spring or autumn. Lomandra – from Loma- (Greek) meaning edge, border and aner, man, male, because of the bordered anthers of some species. longifolia – from longi- (Latin) meaning long and -folia (Latin) meaning leaf.